As has become an annual tradition, the Five Star Institute is once again taking time out to recognize the extraordinary accomplishments of women within the mortgage servicing and housing industries. As part of this year’s annual Five Star Conference, Five Star will present the Women in Housing Leadership Awards during a special banquet on Tuesday, September 18, at the Hyatt Regency in Dallas, Texas. If you haven’t already nominated any outstanding colleagues who have demonstrated leadership and excellence, don’t worry—the nomination deadline for these awards has now been extended to Tuesday, July 10. This is your chance to shine the spotlight on the industry leaders whose drive, encouragement, and professionalism make your company a better place to work and improve the industry’s commitment to helping build the American Dream of homeownership. Click here to submit your nominees. Rising Business Leader Award—Recognizing individuals who, while still early in their careers, have demonstrated an outstanding capability to lead and drive progress (fewer than 10 years’ consecutive industry experience). Cultural Leader Award—Honoring industry leaders who have successfully fostered forward-thinking company cultures and workplaces through corporate strategies and initiatives that have led to tangible, positive outcomes for colleagues company-wide and beyond (minimum 10 years’ consecutive industry experience). The Community Leadership Award—Acknowledging individuals who displayed tremendous leadership and cooperation in local communities. This includes all commendable community achievements by those in the non-profit, government, small business, and corporate sectors (minimum 10 years’ consecutive industry experience). The Diversity & Inclusion Award—Celebrating those who have successfully broken barriers and helped lead the charge in developing diverse workplace cultures by fostering inclusive and welcoming environments for people of every color, creed, and gender to prosper and achieve over adversity (minimum 10 years’ consecutive industry experience). Laurie A. Maggiano Legacy Award—Named in honor of the late industry icon whose distinguished and accomplished career left an indelible impact on housing, this award recognizes those women who through their tireless efforts, collaboration, and ingenuity have powerfully influenced the industry and homeownership nationwide (minimum 20 years’ industry experience). Finalists for the awards will be announced in the September 2018 issue of DS News’ sister publication, MReport magazine. 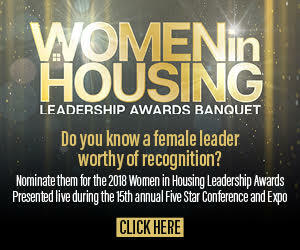 The winners will be announced live during the Women in Housing Leadership Awards Banquet, hosted on September 18 during the Five Star Conference. The winners will also be profiled in the October 2018 issue of MReport. You can hit the banner below to submit your nominations for the 2018 Women in Housing Leadership Awards. Take the time to help recognize the extraordinary women of the industry.